BE SURE TO READ THE PATTERN INFO, BINDING TIPS AND TIPS FOR SEWING WITH KNITS FOR BEST RESULTS! 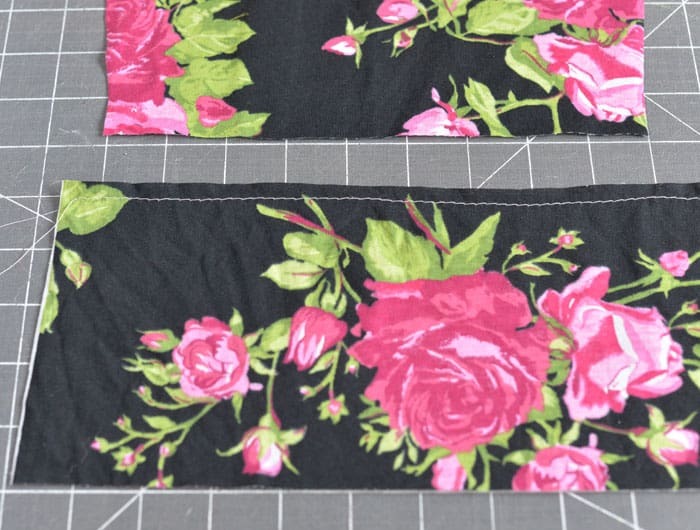 Floral knits on Etsy, another favorite fabric shop for knits: Funkalicious Fabrics. Amount of fabric needed (2 yard needed of 58 inch wide knit fabric for the size 12. Make sure to choose ACTUAL SIZE when printing. Cut out around the grey boxes, lining up the colored dots and tape together. 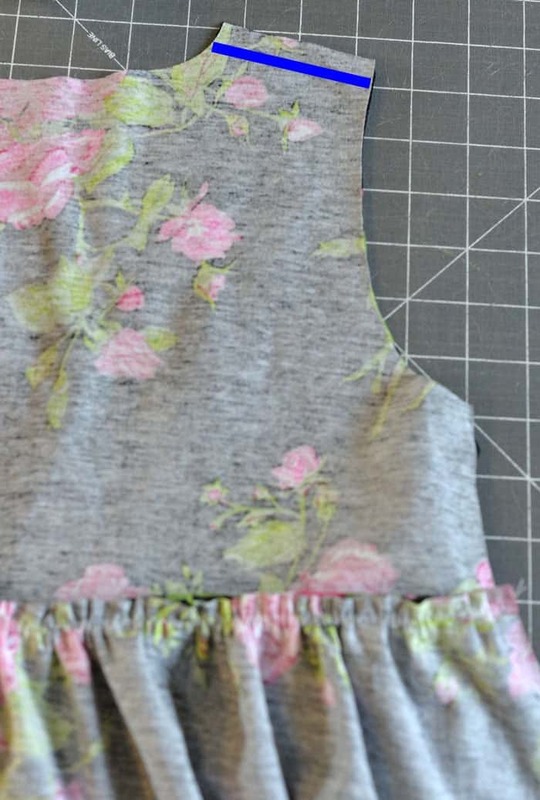 Since this dress is made from knit fabric, I did not include instructions for finishing seams. This is an optional step. 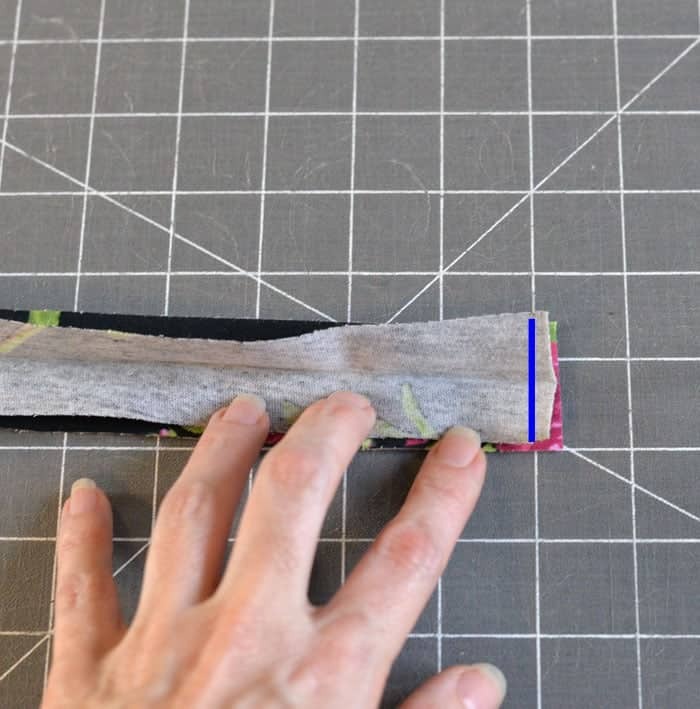 If you find your fabric keeps getting pulled inside the needle plate, place a small piece of tissue underneath the fabric so the feed dogs have something to grip. My favorite fabric shop for knits: Funkalicious Fabrics, Fabric.com and Girl Charlee. 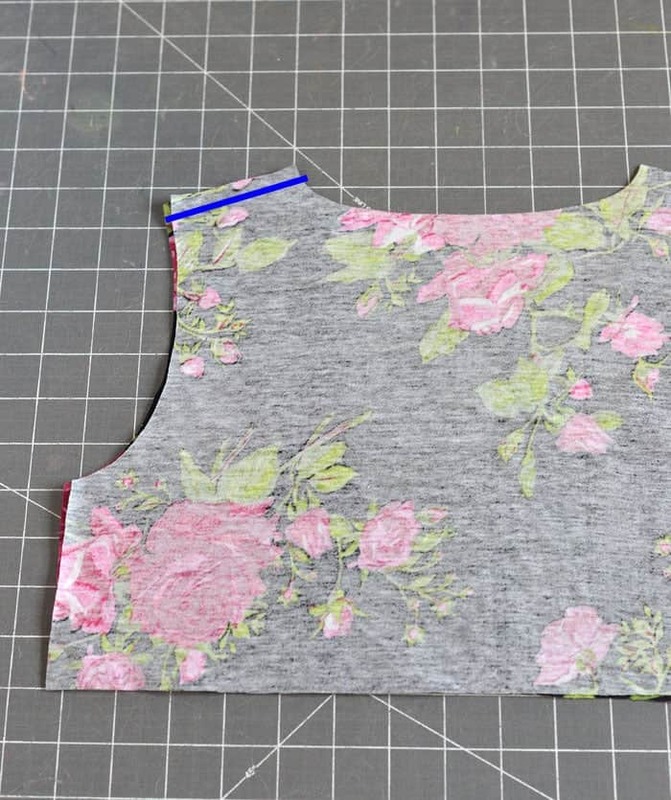 Step 1: Print and Assemble pattern, cut out pattern pieces. Step 2: Cut pattern pieces from fabric. 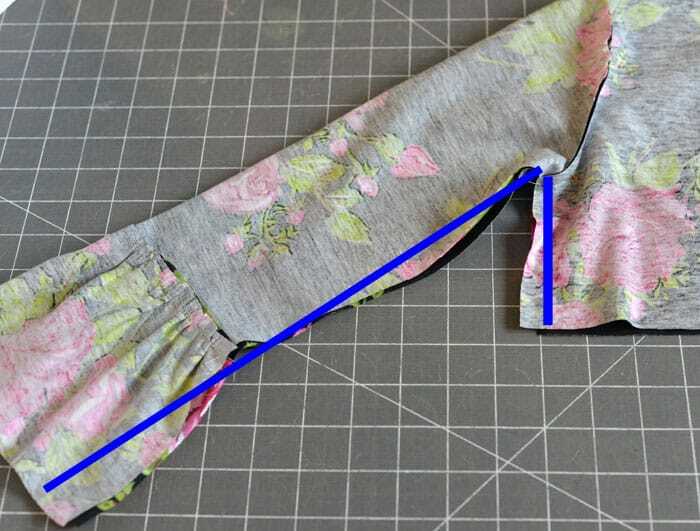 Fold fabric so the stretch is running side to side. 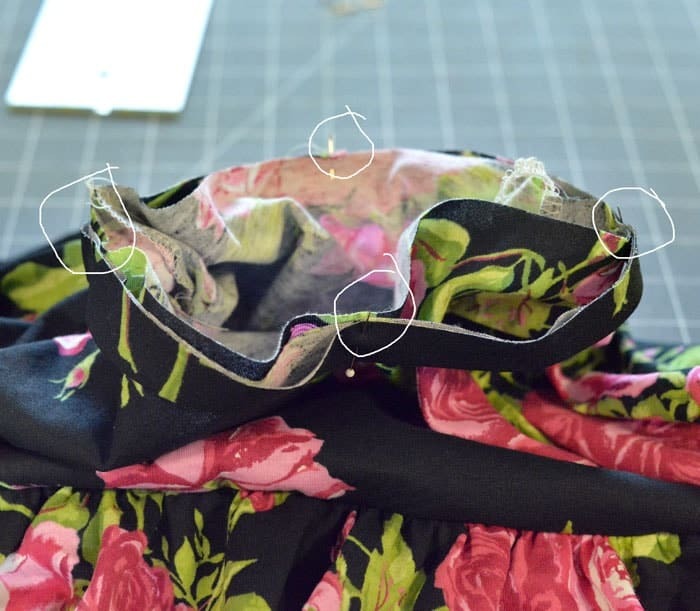 Follow cutting instructions on pattern pieces for bodice, sleeve, and neck binding, lining up pattern pieces on fold when directed. 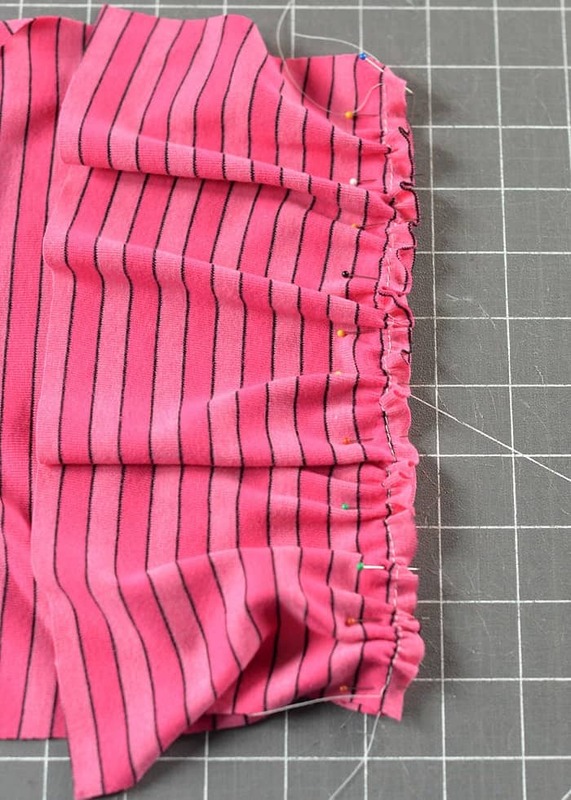 Gather ruffle until it is the same width as the bottom edge of the sleeve. Right sides together, line up the raw edges, pin and sew right above the gathering stitch. Flip sleeve over, press the seam allowance up and topstitch if desired. Repeat for other sleeve. Right sides together, line up front and back bodice. 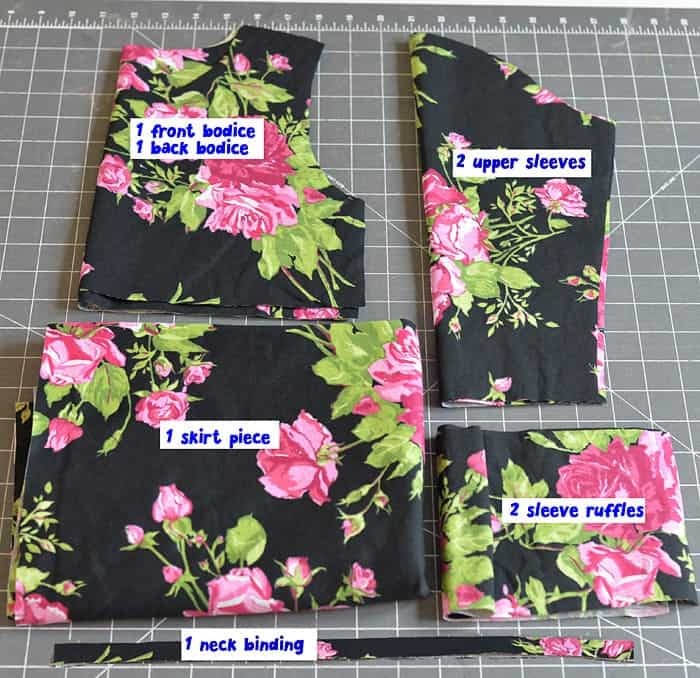 Sew ONE SHOULDER ONLY, using a 3/8 inch seam allowance. Step 6: Side seams and hem. Step 7: Gathering and attaching skirt. 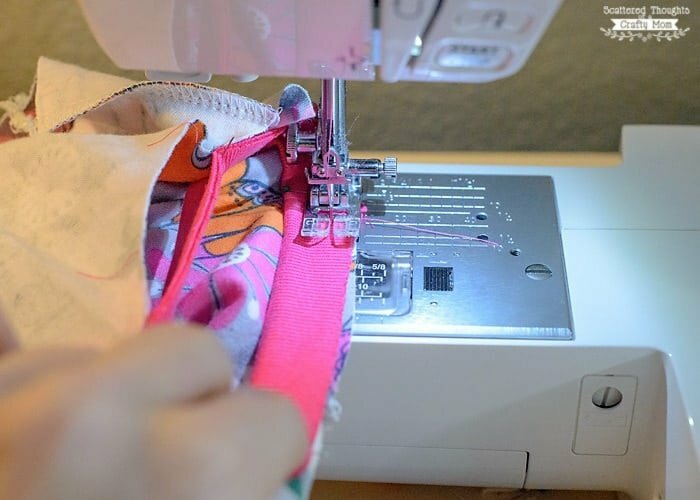 Sew a gathering stitch along the top of the skirt piece and pull on bobbin thread until skirt is same width as bodice. Right sides together, line up the raw edges of the skirt and the bodice. pin and sew along the gathered edge. 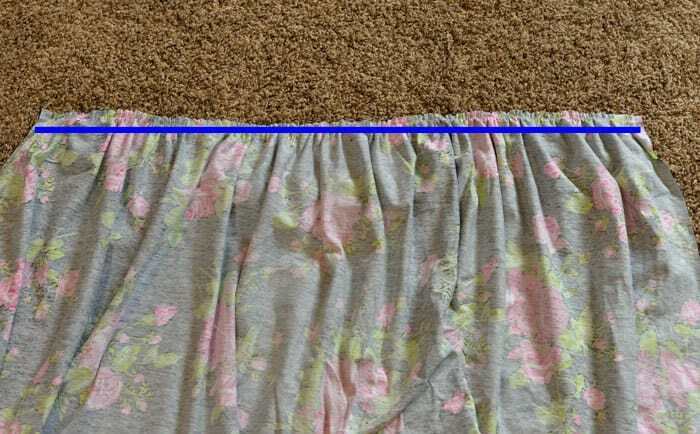 Turn over, press and top stitch along this seam if desired. Step 8: Putting dress together. Line up 2nd shoulder seam and sew together with a 3/8 inch seam. Line up sleeve as before and sew. Line up sleeve and dress edges and sew together with a 3/8 seam. Step 9: Attaching neck binding. Fold and press binding strip in half. 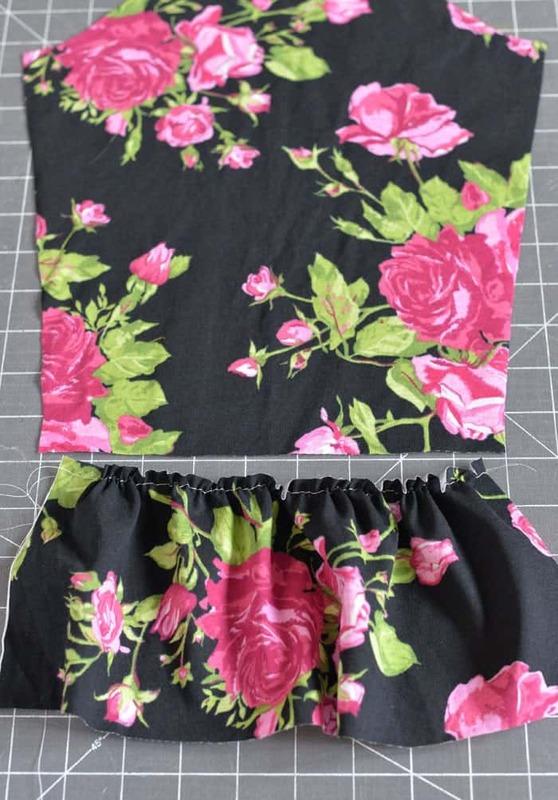 Unfold binding, sew with a 3/8 inch seam allowance and trim excess seam. 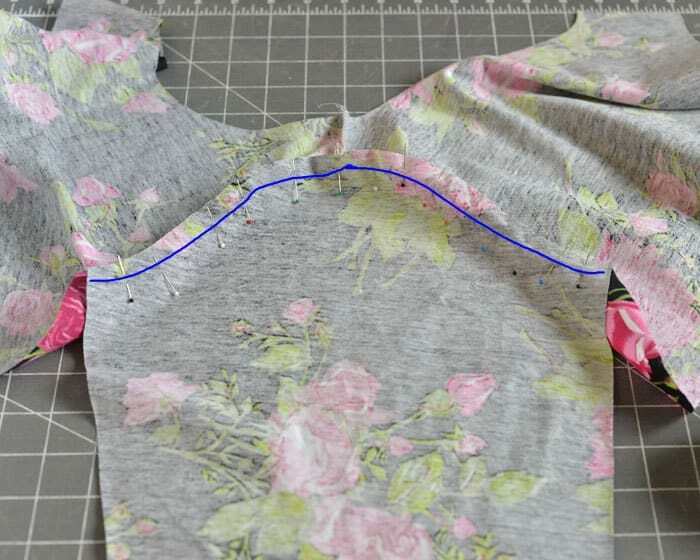 For a more finished look, you can topstitch along the edge of the neckline. Don’t forget! 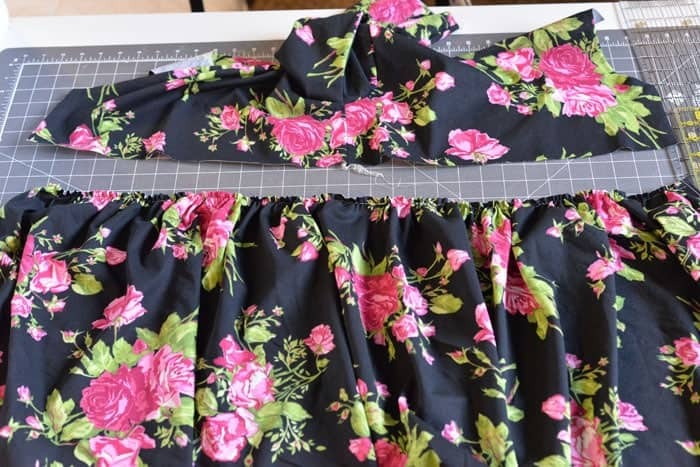 If you make anything with one of my patterns, be sure to come back and share a photo of your finished project on my Facebook page or tag me on Instagram @scatteredmom, with #scatteredmompatterns! Wow, this is terrific! I’m so thankful for what you do! 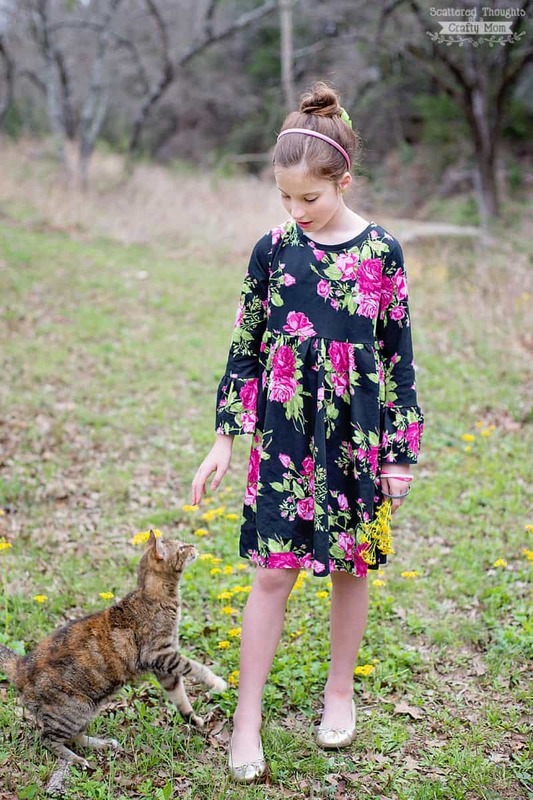 It is so hard to find modest cute clothes that are age appropriate for my girls. I love many of your patterns that you’ve created and provided. What a blessing! Can’t wait to try this one out! Your page is my all time fav! You are so very talented and your photos are beautiful, along with you and your kiddos! How much fabric will I need? about 2 yards needed of 58 inch wide knit fabric for the size 12. A little less for smaller sizes. I’ve printed the pattern and the instructions/pattern for the t-shirt dress but am missing dimensions for the skirt for the bell sleeve dress. Where is it??? 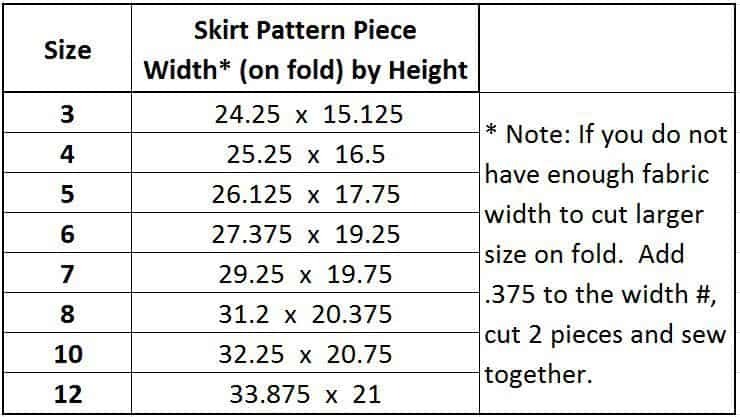 The skirt cutting instructions is a little chart included found on the sewing instructions page. I can’t get the scale right. I don’t have adobe on my Mac. Tried downloading it and was only able to download other PDF reader. Also tried through iBooks on my phone. Is the scale square supposed to be 1 inch? Mine just keeps being 1.5 inches despite making sure there is no formatting. Thanks so much. Jessica. The only way I know to get the scale right is to use the adobe reader. Sorry I can’t help more. Made this today for one of my daughters. It turned out so cute, and very true to size. 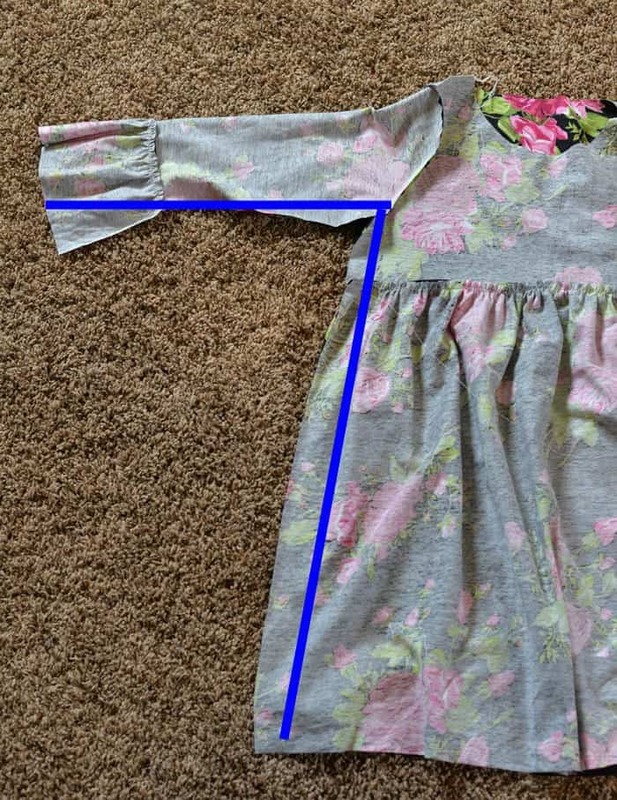 A simple pattern that creates a stylish and easy to wear dress. Thank you!